Beverly Moss' after-school reading of "I Got Bank!" 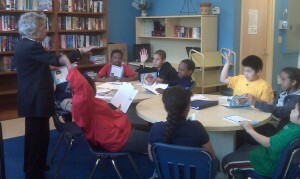 The students, counter-clockwise, are: Jaida, Saba, Kevin, Ellen, Anthony, Yaovi, Jepherson, Carlos, and Kent. The book’s author, Teri Williams, is also president of a bank that is giving away free copies of “I Got Bank!” to grade schools and after-school programs. 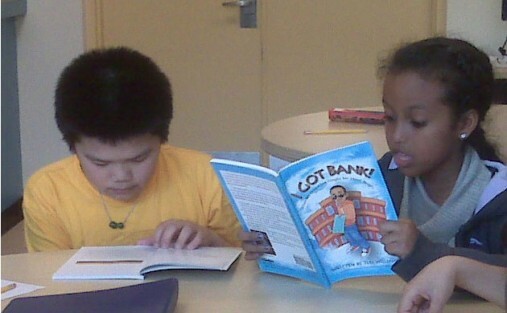 Williams, who grew up in a low-income housing project in Bridgeport, Connecticut, said she wrote the book to help children who have similar backgrounds start learning financial skills. Ellen reads "I Got Bank" during the after-school program at the Mission Park Apartment's library in Boston. The Mission Park youngsters also are writing essays about what they learned from the book for a bank-sponsored competition that will award $1,000 to three students. The list of children’s books about money is pretty short. It includes the Berenstein Bears’ “Dollars and Sense” (2001) and the Cat in the Hat’s “One Cent, Two Cents, Old Cent, New Cent: All About Money” (2008). And “Sam and Lucky Money” (1997) is a beautifully illustrated book about a little boy in Chinatown wrestling with whether to give the four dollars in his pocket to a homeless man. “I Got Bank!” clarifies complex financial issues. Jazz is constantly approached by family members who need money, including his sister, who wants to buy concert tickets, and his brother, who’s better at spending money than earning it.